Dear faithful readers: Happy New Year! If you still visit my blog after months of inactivity, it must be because you truly enjoy healthy cooking. Or, most likely, we are close friends or family. One of my most loyal supporters is my sister-in-law Julie, who visits my blog nearly every day despite my shameful lack of updates. Julie, c’est en pensant à toi que je publie la recette d’aujourd’hui. May your daily visit be a pleasant surprise! Today’s recipe is Bulgarian-style vegetarian stuffed peppers – a healthier take on the traditional chushki burek. It is incredibly tasty and easy to make. In the past few months, I have had the pleasure to be introduced to Bulgarian cuisine and its amazing flavours. This is my first attempt at re-creating what can possibly be classified as the tastiest meal I ever had. 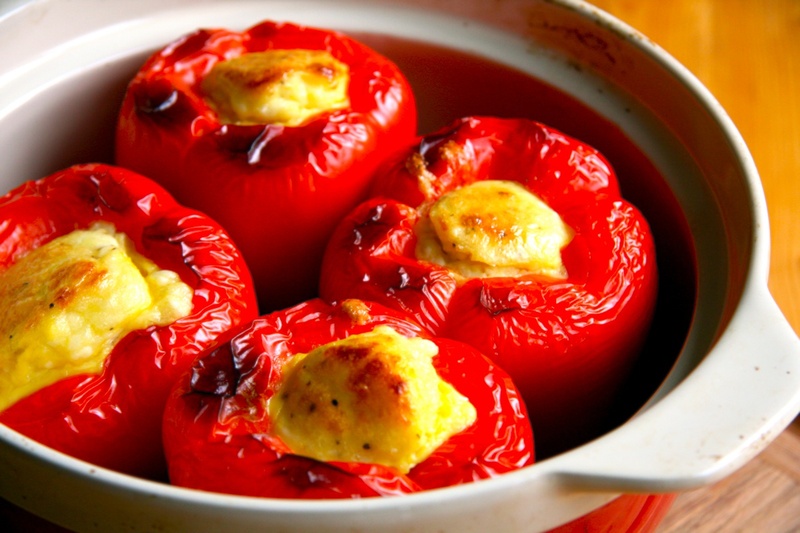 Preheat the oven at 375 F. With a paring knife, remove the stem of each pepper and discard the seeds. Place in a ceramic baking pan, ready for stuffing. 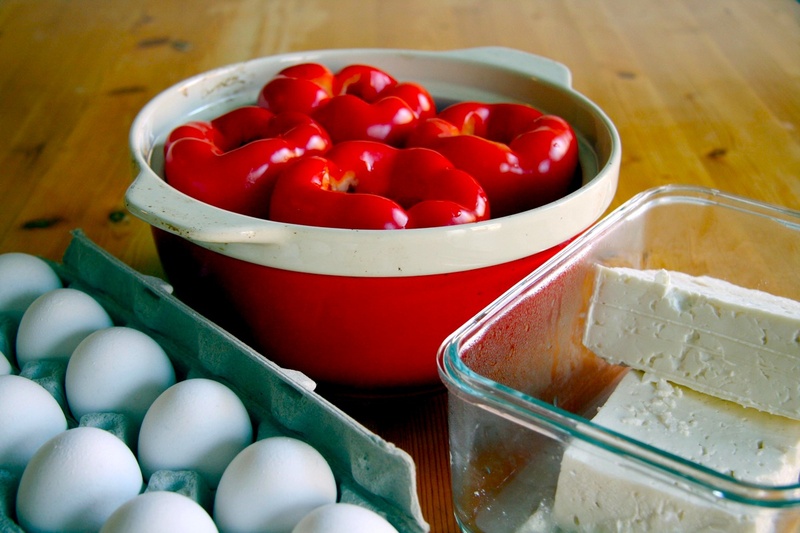 Whisk together the eggs and the crumbled cheese to obtain the desired consistency [it’s not an exact science – the peppers will still turn out nice even if the consistency is a bit more runny]. Sprinkle with some black pepper. Stuff each pepper with the egg & cheese mixture. Make more of the mixture if necessary to fill the peppers to the top. Bake in the oven for one hour, covered by a lid or foil. Remove the cover and continue baking for 15-20 minutes to obtain nice golden tops. 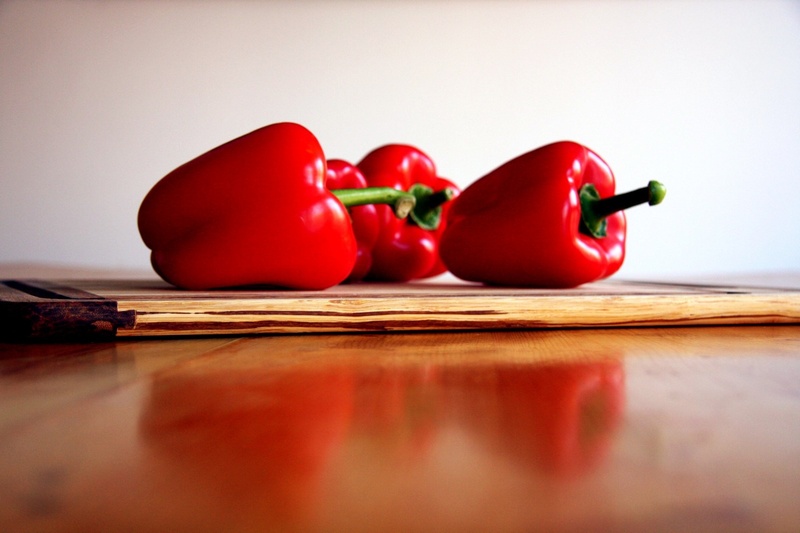 You want to ensure that the peppers are well cooked, tender and juicy, but they should still keep as whole. 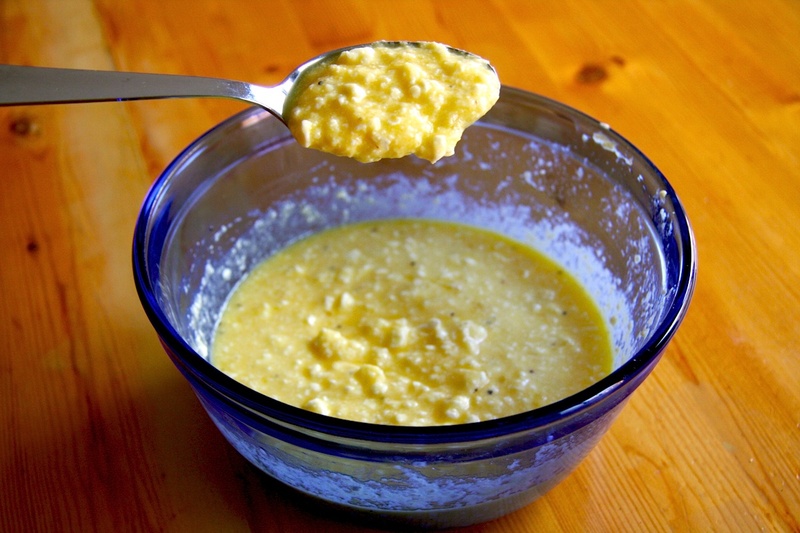 The egg mixture will expand and firm up nicely. 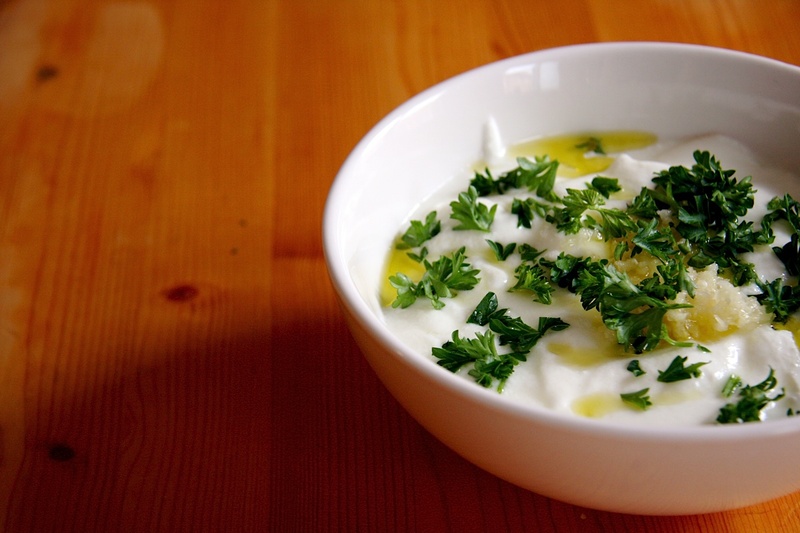 Meanwhile, combine the yogurt with the garlic, olive oil, salt and parsley in bowl and set aside. 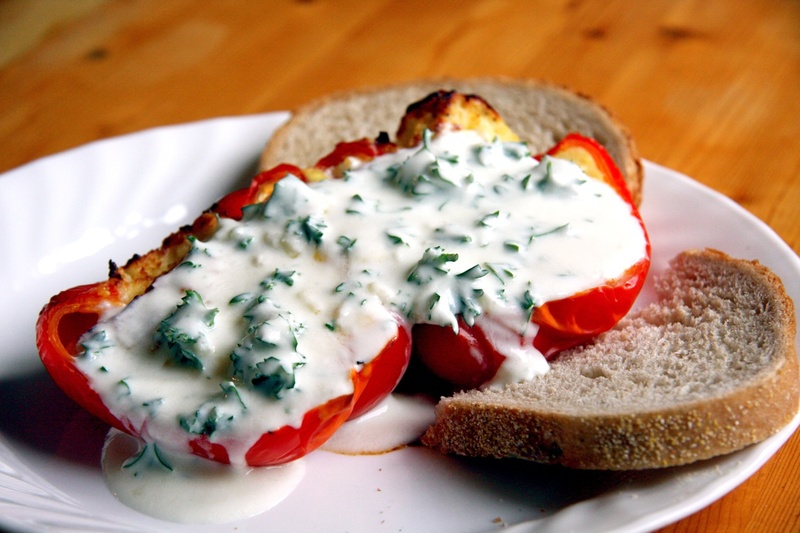 To serve, carefully place one pepper per plate and gently cut lengthwise to reveal the delicious egg mixture. Enjoy with (a lot of) yogurt sauce and a piece of rye bread. Psst, I love parsley but feel free to use less. UPDATE March 12 2013: I’ve been meaning to tell you this for awhile. 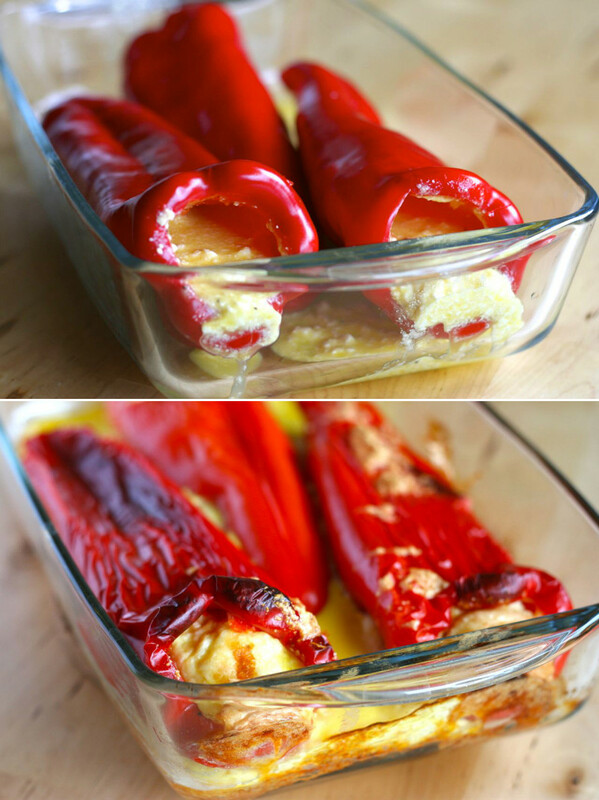 Traditionally, Bulgarians use long sweet red peppers rather than bell peppers when making chushki burek. The outcome is a little more messy with long peppers, but oh so good. See below. Recipe adapted from a Bulgarian friend. Sounds delicious! My mom's Bulgarian and I miss that sweet home cooking. Stuffed peppers, tomatoes, cabbage and zucchinis are my favourite. I'm always interested in learning about new cuisines. This sounds really delicious and easy! Thanks for sharing! oh this is divine!!!! I'm totally doing this! Do you have more like this to share with us? Beautiful presentation! 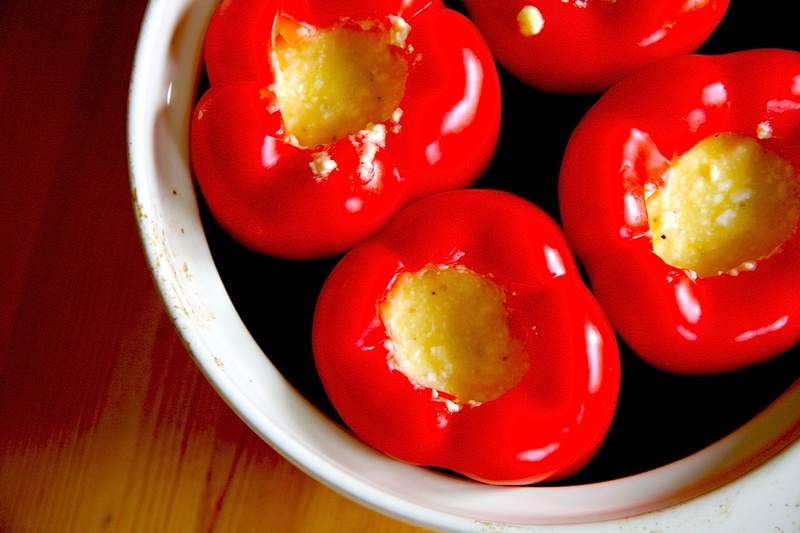 This is a delicious way to enjoy stuffed peppers. These can even serve as a meal too. I tried your recipe today and because my peppers were rather small and the mixture was enough I also stuffed two tomatoes and I baked them all together. The result was unbelievably delicious. I plan to make these stuffed peppers very often. That sounds delicious – I will have to try that next time. Thanks for visiting! I just found your website (google search for a barley salad) in the past week and I wanted to let you know that I love your blog. I've been busy trying out many of the recipes. Keep up the good work! I'll be visiting often. I made this recipe last night and was really kind of disappointed 🙁 We could barely taste the feta, much to my surprise, and the vagueness of the ingredients of the yogurt topping resulted in a WAY too strong parsley flavor (tried to eye the parsley based on your picture). Also, the egg seemed to settle in my peppers, so bites from the bottom were basically just a pepper stuffed with very bland baked egg. Feta stayed at the top, which was strange. Suggestions would be to get more specific on ingredients (what kind of parsley for example, how much olive oil, etc). It also needs way more seasoning. My husband and I agreed that it had so much potential but for all that delicious looking ingredients, it just really lacked any taste at all. I always like trying new recipes so thanks so much for the post, just wanted to provide some honest feedback. Thank you for visiting and my apologies for the delay in responding. From the sound of it, you may not have put enough feta. In terms of parsley, it's really to taste. I happen to love parsley, but feel free to use less! I just found you blog today and I am thoroughly enjoying looking at all your recipes. I do hope you will continue to post them. I can't wait to try some of your recipes. I've already bookmarked several of them. I'm always looking for new veggie recipes. Thank you for your feedback! I'm glad you enjoy. Your recipes are really nice. I find each & every unique. Though, some are quiet time consuming & quantity used is upto point but everything is tasty. From, where you learned all this? Thanks for this sharing. Thanks for your comments and visit. I find the recipes from a variety of sources, healthy cookbooks, family, friends and I also get inspired by what I eat in restaurants. I hope you enjoy. Happy cooking. Hi, I'm having a delicious time looking at all your photographs and eating the recipes. In Australia we call the long sweet peppers – Bullhorn Peppers – and I bought 1 1/2 kilograms today. Guess what I will be cooking tomorrow night! !